Case Study: A precision marketing product using Silverlight - Nova Software - Offering .NET development services, experienced C# and ASP.NET developers. Based in US, the client has been perfecting the art and science of precision marketing for over 15 years. They are one of these precision marketing leaders in United States and possess more than 130 business customers across America. The client intended to develop a high performance and easy-to-use product to harness the power of Farm Service Agency (FSA) data to deliver pinpoint prospect identification and precision mapping, giving users a complete picture of their market perspective. It is easy to learn and use, which is beneficial for subsequent system maintenance. With the crossing platform character and strong UI design capability, Silverlight can bring a similar user experience of desktop application. Meanwhile, combining Silverlight and MVVM during development can allow designers and developers to work at the same time to reduce the development duration. MVVM is a specially designed for WPF and Silverlight . Besides, it sets up several development standards: the program should be feasible to unit testing, easy to maintain and of a high readability. 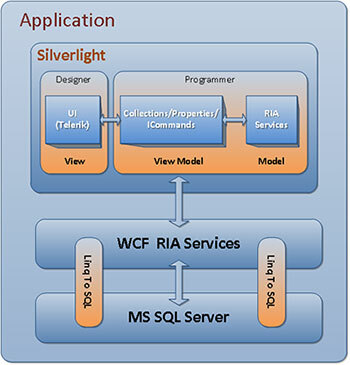 We adopted WCF RIA Services to fetch data because Silverlight is a client-end implementation platform and it can't directly read data as ASP.NET. Compared with WCF, ADO.NET data service and Web service, WCF RIA Services is easier and simpler to use. Additionally, we took advantage of the 3rd party control Telerik to present UI. Telerik has a powerful skin function and supports WCF RIA services with outstanding performance. In this way, we saved the development time and cut down the cost. We applied agile development mode in this project because it could help us quickly respond to client's feedbacks. The most difficult thing while developing was to clarify and understand these requirements. On one hand, we frequently consulted our client to familiarize business logics. On the other hand, we needed to communicate and share thoughts with each other regarding these changing requirements. Based on our rich experience, we set up a perfect communication mechanism to ensure a good understanding of requirements. Also we had an efficient development mode to best adapt client's adjustment. The client sent task details to us via TFS. Upon the receipt of tasks, firstly we analyzed them and started to code for clear parts. Meanwhile, we emailed the client a list of uncertain/unclear requirements for their clarification. We updated our work and project process on daily and weekly basis. While we were developing new requirements, the client could test and evaluate finished work and shared their comments/thoughts via TFS. With a step-by-step iteration, we successfully accomplished the product on a timely manner. The product is welcomed by users and the client benefits from this. Product of high quality user experience. Being born to support asynchronous data access, Silverlight will bring a real time experience to users. Product with strong UI presentation. Default animations and the Visual State function of Silverlight can help users to easily make more attractive pages.